Have you checked out our Special Offers for July yet? We have got some fantastic special offers for you in July 2014! Want to know what’s down deep? Already an Open Water diver? The PADI Advanced course will open up new possibilities for you. Do you just want to go diving? We have it covered. 4 dives for only 120 euro. These offers are available throughout June and can also be booked in June and taken at a later date. PADI Rescue Diver………. Almost a Divemaster! So I just finished the first half of my internship and I can’t believe everything that I’ve done so far!! I went from an Open Water diver to a Rescue Diver, and went from 18 logged dives to 43. All of the diving I’ve done has made me such a better diver. I can feel myself moving from amateur to professional! 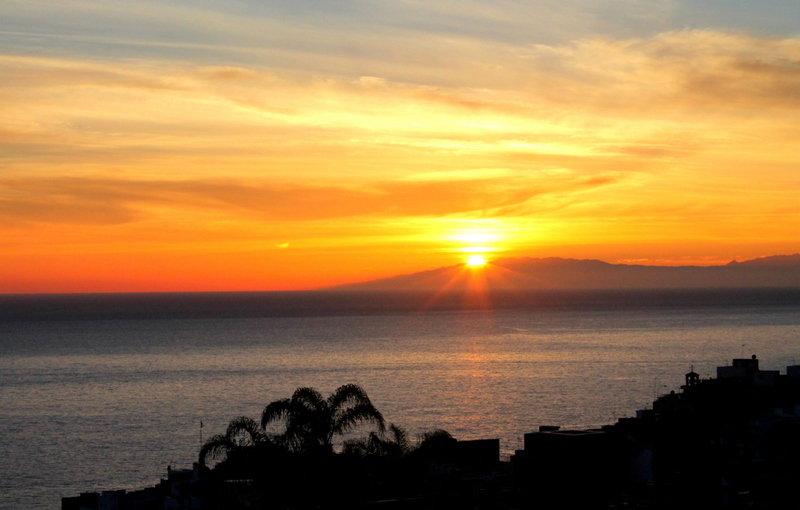 Tenerife is such an awesome Island to visit, there is just so much to do and see. We all know the diving is great, but with so many other things to do, there is just not enough hours in the day! This week started off really great, we got a lot of time in the shop to get most of our Divemaster book done. We’ll be able to do our exam next week… whoo! We had a fellow American, Paul, come and dive with us for a bunch of days. We got to dive Radazul, Abades, and Yellow Mountain, which is an absolutely brilliant dive site. Paul is an awesome Advanced Open Water Diver and a pretty cool guy. Next week Patrick and Buzz are leaving and im gonna miss them like crazy, they both became very good friends to me. Well if the rest of my internship will be as good as the first half (It will be impossible not to be) I’ll be very happy. I’ll see you guys next week. Cheers!! Thinking about getting away from it all? Get over to Tenerife, the temperature is a glorious 28 degrees with low humidity and the water temperature is around 22. 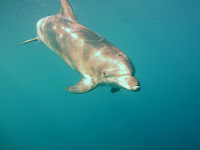 With perfect diving weather and so much more to do in Tenerife it is the ideal holiday solution. Need help with accommodation and excursions? Just ask and we will arrange everything for you. 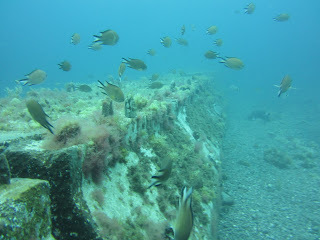 The summer is really with us now, all blue skies every day, fantastic diving conditions and as usual so much life to see. We have had a great June, and have met some great divers, both New divers and experienced divers. We completed our third Dive against debris at the end of this month, we had great fun, as well as collected a large amount of debris from the sea at El Puertito where the Turtles live, obviously our dive was enhanced by the arrival of our resident turtle clan. We were stunned to pull blankets, Wine Bottles, Beer cans as well as 100’s of meters of fishing line and weights out of the sea. When we surfaced we had 5 bags full of ocean debris. It was a great feeling that you can make a difference. We will be completeing our next dive against Debris mid july, so if anyone is over here having a break please contact us for details. We were pleased to welcome Kim (Alice) back to Dive and Sea, she has now joined us as a member of staff, and so will be helping out around the centre. Kim will now officially become Alice its even on her new T shirts. Alice is hoping to complete her Assistant Instructor course next month, when she will have been diving for a whole 6 months!! Alice is also translating our website into Dutch, and we have a friend translating it also into Spanish so look out for the new look pages! 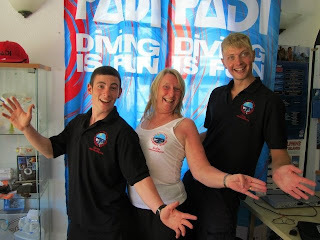 Congratualtions to Aaron who passed his Divemaster course this month as well as his DSD Internship . Aaron will be returning to California at the begining of July to where he hopes one day to work for National geograhic as a diver, good luck to him! 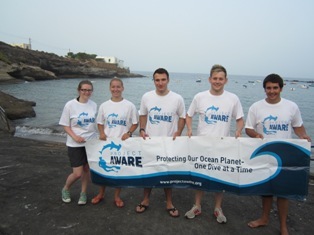 It was great to welcome new Divemaster interns Will, Thomas, Jake, and Jamie who all stared on the 18th June. Will joined us as a PADI Rescue Diver, having not been in the water for a number of years he has been excited to refresh all of his skills as well as start working on his divemaster course. 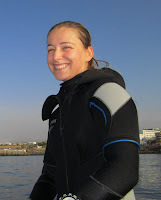 Jamie joined us as an Advanced Open Water Diver, due to an extreme alergic reaction she has been out of the water for a while, and will start her Rescue course at the begining of July. Jake joined us from Sunny birmingham as an Open water Diver, and so far has managed to complete his Advanced open Water diover and is now working on his Rescue Diver certificaiton. We are looking forward to welcoming our next batch of interns Foster, Matthew and Alex who start at the beginning of July. This mask and snorkel set comes in 3 colours, white, turqoise and blue, and comes with carry bag. Purge snorkel for ease of use and silcone mask allows for universal fit. 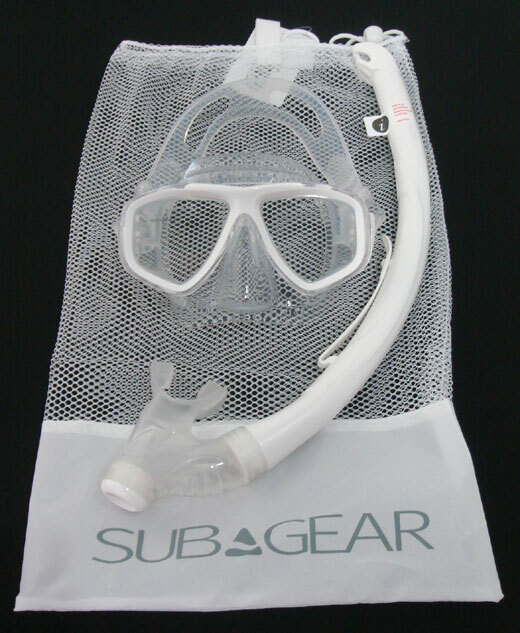 A great value Mask and Snorkel set which will be durable and comfortable. This dive site never ceases to amaze me with the variety of life that you can see there, its a fantastic dive site as your 1st Dive or your 1000th dive. There are resident Fangtooth and Black Moray Eels as well as Octopus and Anemones. Abades bay is a shore dive site and suitable for all levels of diver, from Discover Scuba Diver and upwards. We walk out across the beach and head out into the water descending into approximately 5 meters of water, we then follow around the rocky reef, as you move along the side of the reef looking in the cracks and crevices you will see a whole variety of life, when you head up onto the top of the reef its almost like you are in an underwater meadow as the plants growing on all the rocks cover every surface. When the sun is shinning its even more beautiful. 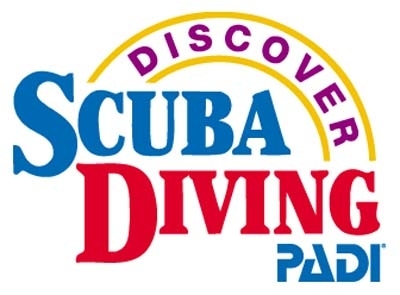 The PADI Master Scuba Diver certification is recommended for any diver that has a real passion about diving and wants to join the best of the best in recreational scuba diving. By achieving this certification, you will discover different sides of diving and take your diving skills to the next level. 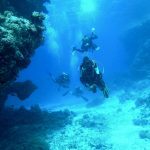 You can choose the five PADI speciality courses that you find most interesting, or let your PADI Instructor advise you and help you choose the ones that suit you best. 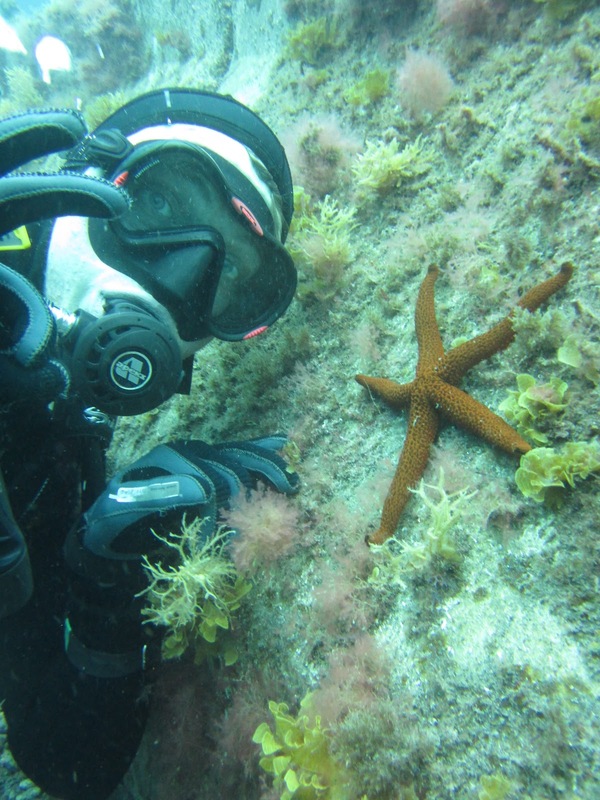 If you are passionate about diving, this will be the right course for you! We are now running 8 week internship from the 1st of every calendar month, the next start date available is 1st September 2012. We provide all the training for FREE, however there are costs involved with regards to PADI materials, diving insurance, diving medical, accommodation & equipment. All diving is FREE for the whole duration you are with us we guarantee you that you will do a minimum of 60 Dives, some of our interns manage over 100 dives! If you have any questions take the opportunity to check out our web page. Hello EveryoneI hope that you have all had an enjoyable month. Here at Dive and Sea we have welcomed back the lovely hot summer weather of Tenerife and the water temperature is heating up nicely!! We have been busy meeting our new Divemaster intern and new divers to our centre, and as always a pleasure to welcoming back familiar faces. I hope that you are all keeping updated with Facebook as well as website news. We had the most wonderful dive against debris not only could George, Melissa and Chris pat themselves on the back for the two large bags of debris collected at Pequeno Valle but on their ascent they were surrounded by a pod of 4 Dolphins, it was an amazing experience and I am sure the Dolphins were thanking us for tidying their sea up! I think the dolphin looks like it is smiling at us!! After this wonderful experience we were off to continue our good work at Starfish bay culling more Urchins.. It was all go last month, following the successful completion of their divemaster course Zippy and bungle started on the Assistant instructor course, they were joined by Jackie from Teide Divers. All of the candidates performed brilliantly and it was huge sign of relief when they passed all their presentations and exams. Well done to all three of you. Below proudly showing off their new Assistant Instructor T shirts!!! We said a sad farewell to George and Chris a hard act for new intern Aaron to follow but I am sure he will excel during their internship. We welcomed Aaron from California who has managed to gain himself a whole variety of nicknames starting with Canadian Dave and I think we have finally settled after much debate on Juan! 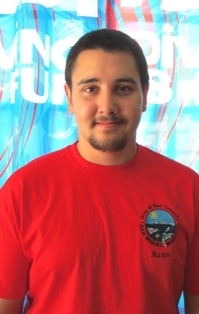 Juan has joined us as an Open Water diver and whilst he is here for his 8 week induction he will be completing his Master Scuba Diver Certification, with Navigation, Boat, Fish ID, Deep and Search and Recovery Specialties as well as his Divemaster Internship. Aaron worked hard all month, and is just getting to the last items on his divemaster internship he managed to improve his stamina and got great scores on all of them, despite the stress and studying for his Divemaster exams he did really well. Watch this space or log onto their blog for more regular information. We are looking forward to welcoming the summer interns arriving in to start mid June, Will, Geoff, Jamie, Alex, Matt and Foster more info about them next month. Of all the equipment you carry with you as a diver, your knife looks like the simplest one. But you’ll soon discover that it has many purposes. Perhaps the most important purpose of a diving knife is that it gives you the ability to cut yourself or your buddy free, if you’d get entangled under water. Therefore it is recommended that you always have your diving knife with you whilst you are diving. 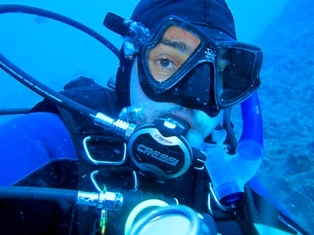 Another purpose for your diving knife is specific to the local area of Tenerife. You can use your knife to help the environment, by killing Black Long-spined Sea Urchins. Unfortunately, Black Long-spined Sea Urchins are now abundant in the Canary Islands, and take over much of the habitat of other species. 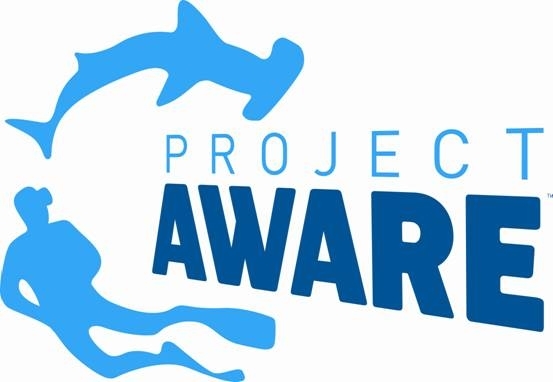 The diving community requests every diver to help maintain control the number of Black Long-spined Sea Urchins in the waters surrounding the Canary Islands, so that the habitat will be given back to the native species. 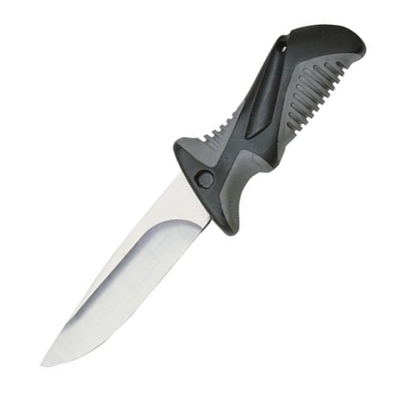 One great value dive knife is the Aqualung Zak, 45 Euros. 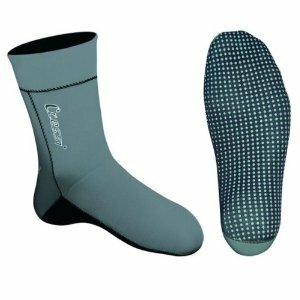 The blade is made from stainless specifically designed for the marine environment, with a blade length of 10 cm perfect for Urchin culls. 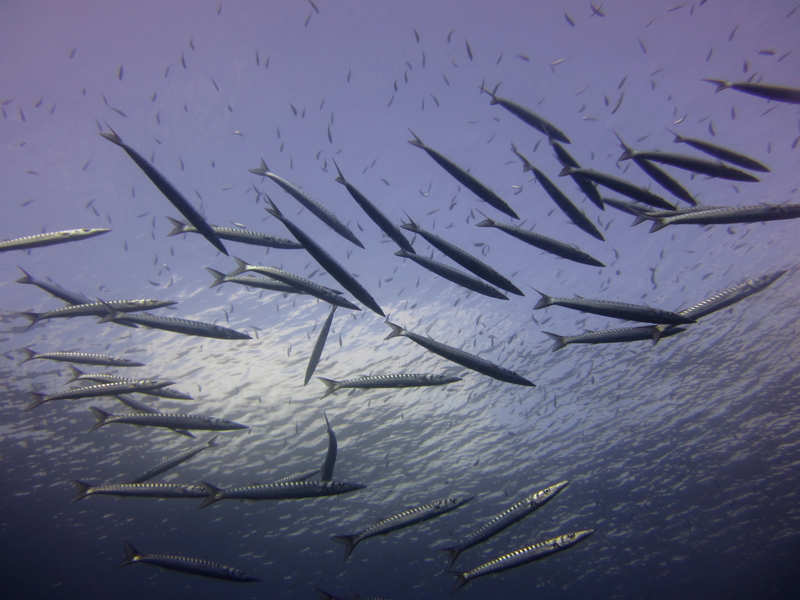 Poco Naufragio is a beautiful dive site in the south of Tenerife. ‘Poco Naufragio’ means ‘small shipwreck’. It’s not just the name, and the wreck that would make you curious about diving at this dive site. It’s THE place to see one of the most intriguing creatures of the ocean: Stingrays. The Stingrays can get up to four meters wide, even without their tail. Poco Naufragio is only a few minutes from the marina. When you following the line down, you’ll find that it is attached to a block of concrete, that is placed on a shelf. The shelf houses many different species of aquatic life, and is semi-circular shaped. Some of the species you’ll find on the shelf are Moray Eels, Arrow Crabs, Scorpion fish, Lizard fish and an occasional Stingray. You could dive while staying on the shelf throughout the dive, and not go below 18 meters. If your certification level allows you to go deeper, than you can descent further, next to the shelf, and visit the wreck itself. The wreck is found on a sand bottom, and is about 4 meters long. The Stingrays that live in the area, are usually seen near the wreck, but they do occasionally visit the shelf as well. Stingrays are commonly sighted at Poco Naufragio, but it’s never a guarantee to see them, as they are wild animals. This only adds to the excitement of this dive site, because you never know what to expect. We are now running our 8 week internship from the 1st of every calendar month, the next start date available is 1st July 2012. More from us next month.